Now let's see while getting the meal ready and doling out assignments, all will enjoy a splash of Amphora Chardonnay or maybe a little Amphora Zin for those who want add a little more zing to their prep time. For dinner the Lakeville Pinot and Pedroni Cab Franc will be served. Both will go well with the turkey, stuffing and cranberries. Now for dessert, one cannot resist a little Wolcott Petite Sirah. We are getting close to having all the grapes in for the 2012 vintage. Rick, Jim and Paddy have been working 7 days a week crushing, pressing, filling barrels, and getting ready for the next round of grapes. To make it even more interesting, they have been filling any time waiting for grapes, or for a press load to finish with getting the current Wine Club shipments out the door. October is a very busy month in the cellar, but also a beautiful time to visit. If you're going to be in the area, come by and see what's happening at Amphora! 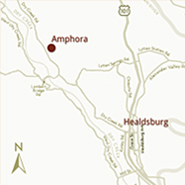 Welcome to Amphora's New Website! We are in the middle of bottling the 2010's! Exciting happenings. Come visit!